From 21 April to 24 May 2018 the Church of Santa Maria della Spina in Pisa hosts Confluenze, the exhibition of the Italian artist Andrea Santarlasci, which includes two unpublished installations: "Where what disappears manifests itself" 2018 and "Senza titolo (declivio) "2018. On 21 April, at 6 pm, the exhibition of Andrea Santarlasci Confluenze, curated by Ludovico Pratesi, will be inaugurated at the church of Santa Maria della Spina. Promoted by the Municipality of Pisa in collaboration with the University of Pisa and the SpazioTempo Association of Michela Rizzo, with the support of the Collicaligreggi gallery and Atlante Servizi Culturali, the exhibition is the fourth of a series of site specific interventions national and international artists made inside the church. A priority moment in Andrea Santarlasci's research concerns an in-depth meditation on the theme of the place, highlighted through and around the relationships between man and his environment. On this occasion, Santarlasci developed a project conceived in close relationship with architecture, but also with its surrounding environment, both historical and natural. The church is located on the embankment, near the bank of the Arno. Recent studies suggest that a branch of the ancient Auser river - the current Serchio - probably traces the route of Via Santa Maria that leads to the Lungarno, in front of the church. "Architecture, with all its religious and spiritual references, the river with its immanent and transcendent contemplative dimension together, the disappeared place of the confluence of the Auser in the Arno, with its susceptible re-enactment, can suggest, and make glimpse an image ..... I tried to trace a common thread that leads us to those underlying themes, to those reasons, of loss and persistence, of emptiness and of remembrance, which unite the church and its context .... Suggestions that open up in a web of multiple references, sometimes enigmatic and mysterious, "explains the artist. a neon inscription that shows a fragment of the Greek philosopher Heraclitus (535 a.c.- 475 a.c.) - In the same rivers we enter and do not enter, we are and we are not - where some weakened letters bring up the name Auser. "And just at the point where you can see a gap, what has disappeared can make its presence glimpse. An oscillation between lack and persistence, a relationship, a short-circuit between what has disappeared and what never ceases to resurface "adds Santarlasci. 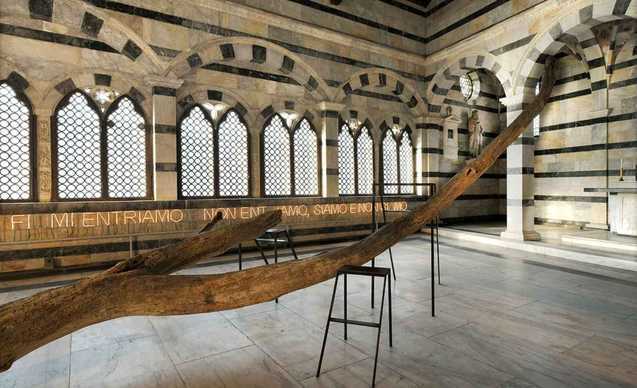 The second work, "Senza titolo (declivio)" (2018) is a nine meter long trunk, recovered on the Tyrrhenian beaches at the mouth of the Arno, resting on the ground and on two stairs, in an oblique position, almost to evoke a deposition , a fall, a loss or death itself- "Within a metaphor of nature, which presents itself in its material reality, I believe that my intervention can be opened, through a transposition, even to all human pathos ... .. Death could be that enigma, that mystery that inevitably brings us back to life, but life with its ineffable but profound signs, with its transience, does not cease to refer us to that enigma, to that mystery that we call death, which accompanies us underground throughout our existence "concludes the artist. "The intervention of Santarlasci respects his research, full of philosophical contents - writes Ludovico Prates- that often combines elements from domestic furnishings with natural finds, to create a displacement between different materials, able to produce that renewal of the gaze, but also of the tangible perceptive experience that is one of the main purposes of art. "